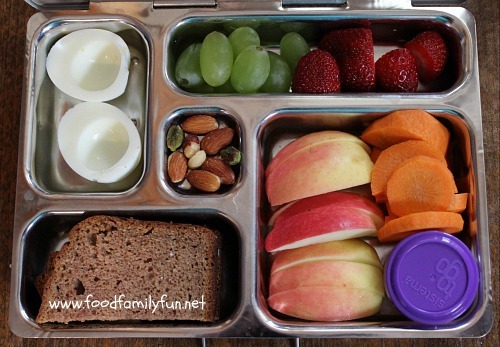 Snack box Lunch packed in a Planetbox Rover. This was for Heidi. She has a boiled egg (yolk removed), grapes & strawberries (from our garden - deelish! ), some nuts, apples, carrot coins with a bit of ranch dip and 2 slices of Peanut Butter Bread from one of our favourite lunch cookbooks. The Best Homemade Kids' Lunches on The Planet. If you haven't bought it yet - go and get it right now. You will love it! Heidi ate everything in her lunch save a few nuts.